62445301681 ../;jsessionid=101791jgouiwyf2qebrt8hfzbe71bs.10179?wicket:interface=:0:beta-club:modal-container:modal-content:content:body:login-rixty-form:visibilityContainer:fbconnect::IActivePageBehaviorListener:1:1&wicket:ignoreIfNotActive=true It seems like your browser is preventing Facebook Authentication. This happens when your browser's Tracking Protection is enabled. To continue logging in via Facebook, please turn off Tracking Protection or use a different browser. 62445301681 ../;jsessionid=101791jgouiwyf2qebrt8hfzbe71bs.10179?wicket:interface=:0:login-panel-small:login-small:login:modal-container:modal-content:content:body:login-rixty-form:visibilityContainer:fbconnect::IActivePageBehaviorListener:1:1&wicket:ignoreIfNotActive=true It seems like your browser is preventing Facebook Authentication. This happens when your browser's Tracking Protection is enabled. To continue logging in via Facebook, please turn off Tracking Protection or use a different browser. 62445301681 ../;jsessionid=101791jgouiwyf2qebrt8hfzbe71bs.10179?wicket:interface=:0:login-panel-small:login-small:signup:modal-container:modal-content:content:signup-form:fbconnect::IActivePageBehaviorListener:1:1&wicket:ignoreIfNotActive=true It seems like your browser is preventing Facebook Authentication. This happens when your browser's Tracking Protection is enabled. To continue logging in via Facebook, please turn off Tracking Protection or use a different browser. 62445301681 ../;jsessionid=101791jgouiwyf2qebrt8hfzbe71bs.10179?wicket:interface=:0:redeemcode:modal-container:modal-content:content:body:login-rixty-form:visibilityContainer:fbconnect::IActivePageBehaviorListener:1:1&wicket:ignoreIfNotActive=true It seems like your browser is preventing Facebook Authentication. This happens when your browser's Tracking Protection is enabled. To continue logging in via Facebook, please turn off Tracking Protection or use a different browser. The Rixty system will be offline while we perform system maintenance beginning at 8:00pm Tuesday, August 21, Pacific Daylight Time (GMT -7). 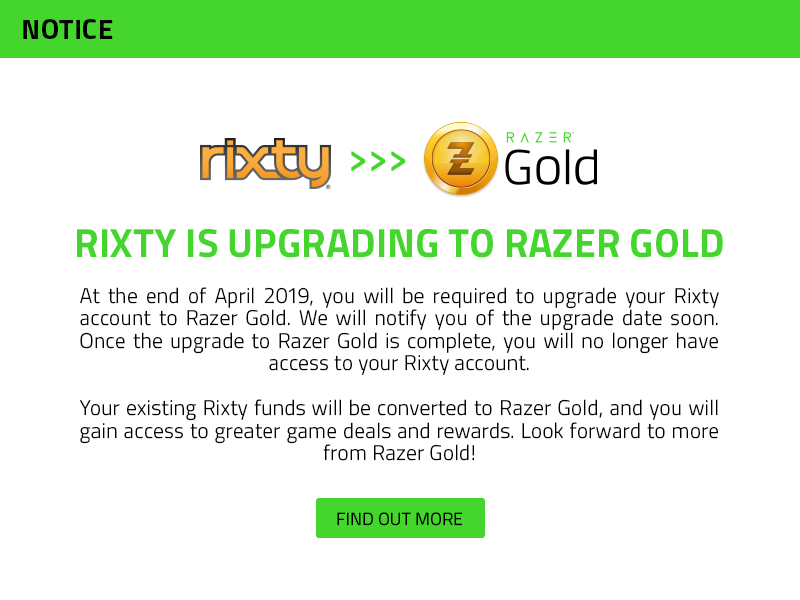 During the maintenance, the Rixty payment option will not be accessible, and Rixty top-ups and card activations will not be processed. Also, users will be unable to access the Rixty website or login to their accounts. A page will be posted to inform users of the downtime and provide an update as to when normal operations will resume. We expect the maintenance to take 10-20 minutes. O sistema da Rixty estará offline enquanto realizamos uma atualização do sistema a partir das 00:00 de segunda-feira, 22 de agosto, horário de Brasília. Durante a atualização, a opção de pagamento Rixty não estará acessível, as recargas de conta Rixty e ativações de cartão não serão processadas. Além disso, os usuários não poderão acessar o site Rixty ou fazer login em suas contas. Uma página de manutenção será postada para informar os usuários sobre o tempo de inatividade e uma atualização será fornecida assim que as operações normais forem retomadas. Esperamos que a atualização leve de 10 a 20 minutos.